When you’re looking to add Air Conditioning or replace your Air Conditioner, turn to the experts at Budget Heating and Cooling. environment. We’ll consider your unique living situation as well as the size, shape and orientation of your home, the square footage, type of insulation and how much insulation as well as a variety of considerations around your windows. Once we have a good understanding of how to properly size your Air Conditioner, we’ll recommend a product. We’ve chosen to represent industry leader Rheem. Why Rheem? Founded in 1925. Their mission is simple. Help your family enjoy a new degree of comfort with solutions that keep you cool in the summer and warm in the winter. 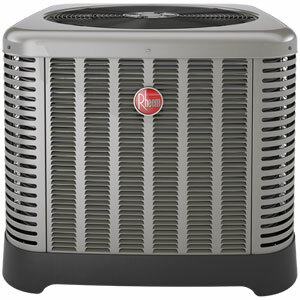 Enjoy a reliable Rheem Air Conditioner and their broad line up of products that fit every budget and every home. to expect from RHEEM. It’s also quiet, so you won’t have to give your indoor home comfort a second thought. You may not know that your home heating and cooling represent 50% of your utility bill. When you consider that, it’s easy to see how important it is to upgrade your air conditioner to a newer, super high-efficiency unit. Air Conditioners – How Do I Choose The Right One? 1. We’ll help you with that. Central air conditioners provide home cooling and can also dehumidify, and filter your home’s air, making it cleaner too! We’ll get the right fit for you by understanding your needs. 2. Do you have hot or cold spots in your home? 3. Does anyone in the house have allergies? 4. Where do you spend most of the time in your home? 5. Would you like to save money on your utility bill? 6. How long do you plan on living in your home? These are just some of the questions our trained experts will ask. Upgrading your air conditioner is not a one size fits all. We’ll make sure to understand your environment and size your new central air conditioner properly so that you’ll have years of indoor comfort. Get Comfortable With A High Efficiency Air Conditioner in Portland, OR. Budget Heating and Cooling offers a broad lineup of high efficiency air conditioners. We’ll help you find an AC unit to fit your budget and needs. Get A Quote or Call today: 503-233-3133.